We'll pick you up from the airport and transfer you to your accommodations for the night. Spend the day exploring Alaska's largest city at your leisure. Overnight Anchorage hotel. Pick up your rental car from Avis in downtown Anchorage. Drive to Cooper Landing and on the way stop for your cruise on Portage Lake where you’ll get up close to Portage Glacier. Overnight Kenai Princess Wilderness Lodge. The day is yours to explore the Cooper Landing area and other communities of the Kenai Peninsula in your rental car. Overnight Kenai Princess Wilderness Lodge. Drive north to Talkeetna and explore the town that serves as a base camp for Mt. McKinley climbers. Overnight at Mt. McKinley Princess Wilderness Lodge, 50 miles North of Talkeetna in Denali State Park. Overnight Mt. McKinley Princess Wilderness Lodge. 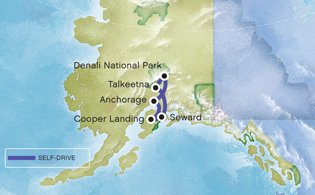 Today, explore Denali’s south side or depart early for the drive to Denali National Park. You'll have as much time as you like to experience the majesty of Denali National Park, take in the sights of the George Parks Highway or arrive at your hotel near the park entrance to take advantage of an optional excursion or a visit to the Denali Visitor Center. Overnight Denali-area hotel. Drive from Denali to Anchorage and return your rental car in downtownAnchorage. Enjoy one last overnight in Anchorage before the conclusion of your tour. Overnight Anchorage hotel.